A GLOBAL STUDY published recently suggests that over 60% of Irish mothers drink alcohol during pregnancy. The study by The Lancet places Ireland first in the top five countries in the world who drink during pregnancy, along with Russia (37%), the United Kingdom (41%), Denmark (46%), and Belarus (47%) – all European countries. 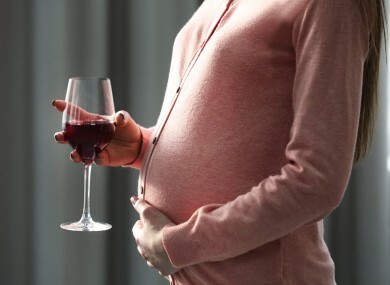 The study was conducted by linking rates of drinking during pregnancy (as reported by mothers in batches of local studies) to rates of foetal alcohol syndrome (FAS) which is directly caused by alcohol consumption during pregnancy. Researchers analysed over 20,000 studies which documented mothers’ reports of drink intake during pregnancy, and excluded any studies with a bias – finishing with 365 studies. This included a batch of Irish studies representing Irish mothers from between 1990-2011 and compared these with rates of FAS per population. Dr Jennifer Donnelly, Consultant Obstetrician at the Rotunda Hospital says the study gives a great oversight into the global rates of alcohol usage during pregnancy, and that the results for Ireland were “startling”. She says that although there are some limitations, such as the study is based on other reports and that the criteria for what ‘drinking’ during pregnancy is defined as, it’s more likely that the figures are a conservative figure for rates of drinking worldwide. In 2008, Dr Donnelly conducted a study of alcohol consumption among 1,000 first-time mothers, and got a figure of 50% – which is very close to The Lancet’s findings. FAS is caused when alcohol blocks oxygen and nutrients from travelling through the placenta to the baby. Altered facial features is another sign of FAS, and occurs when the mother takes alcohol between months 6-9 of the pregnancy, which is when facial features form. It’s not known how much alcohol you can consume before FAS begins; so complete abstinence of alcohol during pregnancy is advised. Children with FAS have problems with their neurological development, and abnormal growth, which may include learning disabilities, poor academic achievement, poor organisation, lack of inhibition, difficulty writing or drawing, or balance problems. An estimated 119,000 children are born with FAS worldwide, according to this same study, but not every woman who drinks while pregnant will have a child with FAS. “We estimated that one in 67 mothers who drink during pregnancy will deliver a child with FAS,” says lead author Dr Svetlana Popova. This was a conservative estimate, according to the researchers, as it doesn’t include other types of conditions caused by alcohol during pregnancy. The lowest levels of FAS were in Middle Eastern regions, where alcohol consumption is illegal or prohibited by religious beliefs. Email “Ireland has the worst rates in the world for drinking during pregnancy”. Feedback on “Ireland has the worst rates in the world for drinking during pregnancy”.